Introducing the new Patriot Full-Electric Homecare Bed with a grid sleep surface!Designed and engineered by the same team who develop the GF Long Term Care beds.Sleep surface is MADE IN THE USA!The single-motor design homecare bed is now available in a full-electric/low version. The Patriot Full-Electric Homecare Bed offers the same features as the Patriot Semi-Electric Homecare Bed with the additional feature of electric height adjustment. This makes it easier for caregivers to raise and lower the bed for patient care and linen changes. The electric height adjustment also enables the patient to easily position the bed for maximum comfort. The Full electric model can be adjusted to be a conventional height homecare bed OR a low bed for better inventory management! Total assembled bed weighs only 178 pounds (bed and motor). Powerful DC motor for effortless height adjustment. Welded motor-guard protects motor and universal joint from damage during shipment and deliveries. Available with Fiberboard Decorative Walnut Bed-ends or High-impact Plastic Bed-ends. Designed to meet the requirements of applicable HCPCS codes. Maximum patient weight 350 lbs. 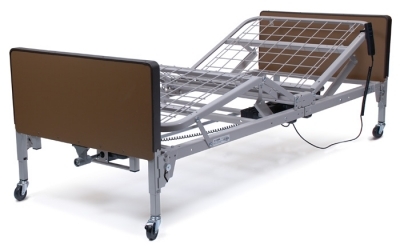 450 lb evenly distributed total weight capacity including patient, mattress, rails, and accessories. Overall Bed Size: 87"; L x 36"; W.
Lift Range: Head – 60°, Knee – 30°. Slots in frame to ensure proper rail placement. Locking pins secure bed ends to sleep deck. Attached lanyards prevent loss while moving or storing. Only homecare bed to offer a 4-inch extension kit that can extend either the head, foot, or both head and foot decking. Bed length will be 84"; with one kit, 88"; with 2 kits. The only homecare bed to offer optional corner mattress retainers. No spring sag or bottoming out with heavier patients. No connecting links or springs to lose. 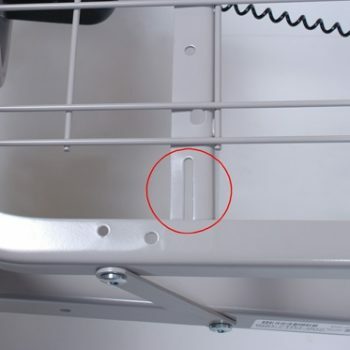 Half-Rail A (GF6650A-1 will not work on the Full-Electric Patriot homecare bed when the bed is used as a Low Bed. You would be unable to lower the rail completely.